Have you seen the KPBS round table footage from Friday Oct 30th, discussing Ocean Beach Town Council President Gretchen Newsom’s candidacy for mayor? One panelist, Tony Perry– San Diego Bureau Chief for the Los Angeles Times– referred to Ocean Beach as the People’s Republic of Ocean Beach (a long-time “nickname” favored by certain mainstream reporters). Perhaps some find that appealing. Perhaps some find that appalling. The panel leader, Mark Sauer, commented that Gretchen Newsom and Gavin Newsom, California lieutenant governor, have the same last name. And he also commented that Ms. Newsom is “pretty,” like Gavin Newsom. Newsom’s campaign is just beginning. But she is raising the heat already for political commentators and Mayor Kevin Faulconer who previously thought he might have an easy and unopposed election. 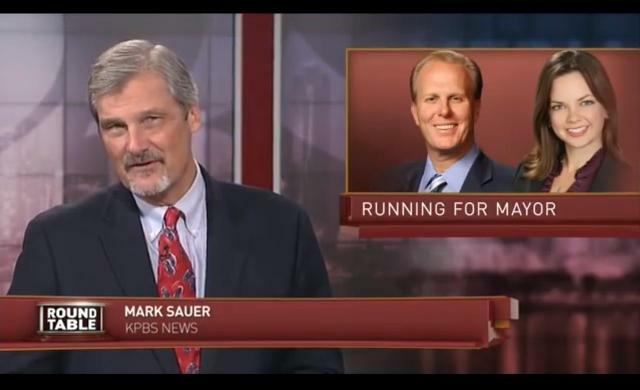 I saw that segment and thought that was inappropriate for a KPBS show …. unless Sauers wants to comment on Faulconers’ looks also I believe a public apology is due to Ms. Newsom. I’ve always thought Kevin was kind of pretty too. For those who don’t want to watch the whole video clip, the “pretty” comment can be found starting at the 15:27 mark.